Home > First report of the Ministerial Task Force on Measures to Reduce the Demand for Drugs. Ireland. Ministerial Task Force on Measures to Reduce the Demand for Drugs. 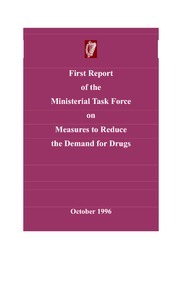 (1996) First report of the Ministerial Task Force on Measures to Reduce the Demand for Drugs. Dublin: Stationery Office. As part of its action programme to tackle the problem of drug abuse, the Government established a Ministerial Task Force in July 1996 to review existing arrangements for a co-ordinated approach to demand reduction, and in the light of the this review, to identify for Governmental action any changes or additional measures needed to provide a more effective response to the problem. The global context in which the current drug problem has emerged is briefly described, and the consequences for local communities, in terms of personal loss, economic viability, crime and quality of life, are outlined. Opiate use in Dublin is identified as the phenomenon requiring most urgent action. While the lack of definitive, quantitative information on the prevalence and nature of drug misuse makes it difficult to determine the exact scale of the problem, other information sources such as criminal detection statistics and treatment figures, provide some indication of the extent of the difficulty being faced. The report emphasises the need to obtain and compile valid, concrete data on the true extent of the drugs problem. The pattern of drug misuse, its 'epidemiology', is described. The views of the Task Force regarding the role of policing and education and prevention in reducing the demand for drugs are outlined. A number of recommendations are made under following headings: structures; information/research; treatment; rehabilitation; education/prevention; estate management; sport; community policing; and, allocation of funding/resources.